Melanoma, the most serious type of skin cancer, develops in the cells that give your skin its color (melanin) and is the sixth most diagnosed malignancy. Avoid exposure to sunlight when the sun is strongest (between 10 am and 4 pm). Apply a sunscreen even on cloudy days. The sun protection factor (SPF) must be 15 or greater. Put it on 30 minutes before you go into the sun. Add more sunscreen after swimming or excessive sweating. Dress for being out in the sun. Wear a wide-brimmed hat, sunglasses that block both UVA and UVB rays and protective clothing (tightly woven fabrics and long-sleeved shirts) when exposure cannot be avoided. Don’t go in the sun with the intention of getting a suntan, and don’t use tanning beds. Surgery is the best treatment for localized or regionalized (involving some lymph nodes) melanoma, and may be a part of the total treatment for metastatic disease. 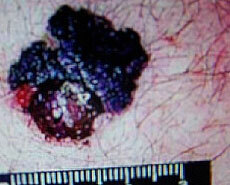 Tumor removal is the first and most important step treating melanoma. Additionally, a sample of the tumor can be biopsied for the most accurate staging of the disease so that additional treatments can be as specific and accurate as possible for each patient. 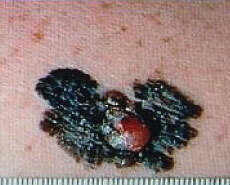 Melanoma removal needs to be thorough. Not only does the area of melanoma need to be excised, a surrounding margin of healthy skin and tissue needs to be removed as well. While this may leave a potentially large scar sometimes requiring skin grafting, this is the best way to ensure no melanoma remains. 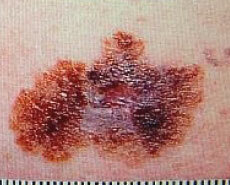 Lymph node screening is very important in the treatment of most melanoma cases. This procedure, called sentinel lymph node biopsy aims to evaluate the first few lymph nodes draining the area of the tumor. Only affected lymph nodes are impacted or treated, minimizing complications and invasiveness. Surgical removal of melanoma and sentinel lymph node biopsy are done in conjunction as one procedure. Surgical specimens will be evaluated pathologically to ensure all the melanoma was removed. If this is found not to be the case, there will likely be one or more additional surgeries.